A TV show highlighting the contributions of Puerto Ricans in the U.S.
Join us Today for a discussion on The Modern Day Lynching of Latinos. Juan Cartagena and Maximo Aguiano talk about the history of institutionalized racism in law enforcement and its impact on Latino culture yesterday and today. What impact is the anti-Latino rhetoric having on our community? What do we need and where do we go from here? And how is the millennial generation going to drive this change? The Department of Puerto Rican and Latino Studies (PRLS) Brooklyn College, City University of New York is searching for an Instructor. Course: Emerging Realities and Alternatives for PRs and other Latin@s in the US. Applications for the 2016 NPRDP Scholarship Program are now available. 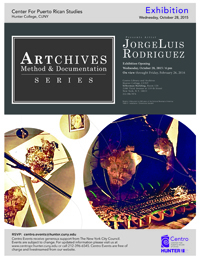 Artist Jorge Luis Rodríguez will meet with guests and residents of El Barrio, the neighborhood where one of his best known sculptures, Growth, has been on display at Harlem Art Park since 1985, to talk about the significance of public art in working class communities and the scope of his artworks and projects. The event will begin at Centro Library with a visit to the ARTchives exhibition. Join Centro Staff: New Job Postings! Centro staff is expanding and new job opportunities are available immediately for applicants with a range of education and experience, from students to seasoned professionals. Please click on the job titles below to read the descriptions and requirements. The Research Associate post doc (one year) will conduct academic research in connection with CUNY programs, may assist faculty, staff, and students in conducting research and lead research efforts involving others. Contribute to the coordination, development and implementation of Centro digital projects. Enforce best practices for processing, quality control, content management, and preservation of digital collections according to national standards. Copyright Centro de Estudios Puertorriqueños(C) 2015 All rights reserved.